With great views of the Aegean Sea, Albatross enjoys a prime spot, overlooking the sandy, awarded with a "Blue Flag", Logaras Beach on the south-eastern coast of Paros island. 36 Cycladic-style rooms are clustered in three groups amidst lush gardens in a private and peaceful setting. 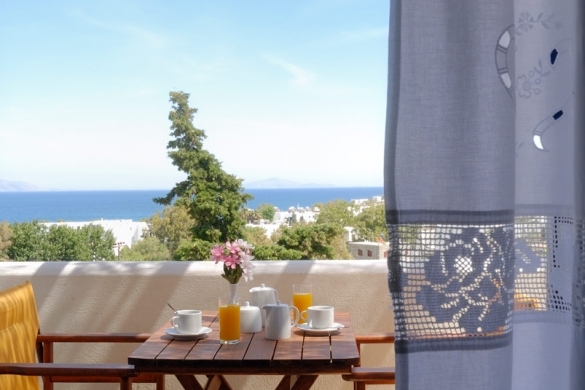 Each of our rooms can accommodate 1 to 3 people in a calming environment comfortably furnished with built-in beds, top quality bedding, A/C, satellite TV, mini bar and verandas where guests can unwind and appreciate serenity enjoying the sea breeze and the fabulous views of the Aegean.